In this tutorial we will Control Servo Motor with Raspberry Pi. Before going to servo let’s talk about PWM because the concept of controlling Servo Motor comes from it. So the average output voltage will be 50% of the battery voltage. As we increase the ON and OFF speed to a level we will see the LED being dimmed instead of being ON and OFF. This is because our eyes cannot catch frequencies higher than 25Hz clearly. Consider 100ms cycle, LED being OFF for 30msec and ON for 70msec. We will have 70% of stable voltage at the output, so LED will glow continuously with 70% of intensity. Duty Ratio goes from 0 to 100. ‘0’ means completely OFF and ‘100’ being completely ON. This Duty Ratio is very important for the Servo Motor. The position of Servo Motor is being determined by this Duty Ratio. Check this for PWM demonstration with LED and Raspberry Pi. A Servo Motor is a combination of DC motor, position control system and gears. Servos have many applications in the modern world and with that, they are available in different shapes and sizes. We will be using SG90 Servo Motor in this tutorial, it is one of the popular and cheapest one. SG90 is a 180 degree servo. So with this servo we can position the axis from 0-180 degrees. A Servo Motor mainly has three wires, one is for positive voltage, another is for ground and last one is for position setting. The Red wire is connected to power, Brown wire is connected to ground and Yellow wire (or WHITE) is connected to signal. In servo, we have a control system which takes the PWM signal from Signal pin. It decodes the signal and gets the duty ratio from it. After that, it compares the ratio to the predefined positions values. If there is a difference in the values, it adjusts the position of the servo accordingly. So the axis position of the servo motor is based on the duty ratio of the PWM signal at the Signal pin. The frequency of PWM (Pulse Width Modulated) signal can vary based on type of servo motor. For SG90 the frequency of PWM signal is 50Hz. To find out the frequency of operation for your servo, check the Datasheet for that particular model. So once the frequency is selected, the other important thing here is the DUTY RATIO of the PWM signal. The table below shows the Servo Position for that particular Duty Ratio. You can get any angle in between by choosing the value accordingly. So for 45º of servo the Duty Ratio should be ‘5’ or 5%. A1000µF must be connected across the +5V power rail otherwise the PI might shut down randomly while controlling the servo. We are setting PIN39 or GPIO19 as output pin. We will get PWM output from this pin. The above command is for setting up the channel and also for setting up the frequency of the Channel”. ‘p’ here is a variable it can be anything. We are using GPIO19 as the PWM “Output channel. “Frequency of PWM signal” we will choose 50, as SG90 working frequency is 50Hz. 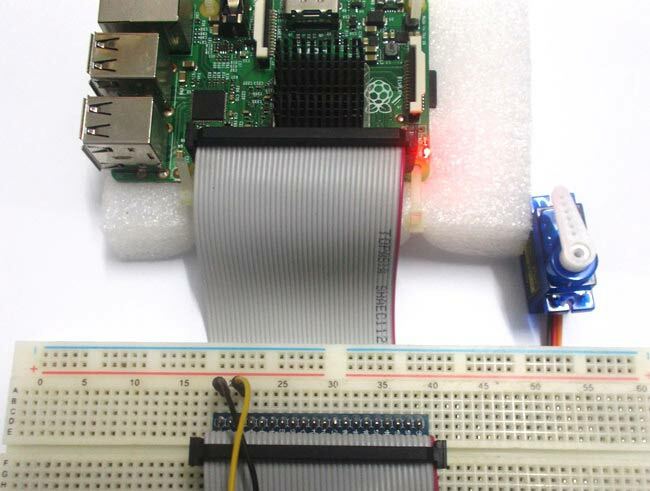 Here the program for Controlling the Servo using Raspberry Pi provides a PWM signal at GPIO19. The Duty Ratio of the PWM signal is changed between three values for three seconds. So for every second the Servo rotates to a position determined by the Duty Ratio. The servo continuously rotates to 0º, 90º and 180º in three seconds. Do you have to run the servo off the 5v pin for the code to work or could you run it off an external power source? This servo (sg90) can be run using power from RPi, but if you use more powerful servo then you need external power source.